Archaic Greece was the period in Greek history lasting from the eighth century BC to the second Persian invasion of Greece in 480 BC, following the Greek Dark Ages and succeeded by the Classical period. The period began with a massive increase in the Greek population and a series of significant changes which rendered the Greek world at the end of the eighth century entirely unrecognisable compared to its beginning. According to Anthony Snodgrass, the Archaic period in ancient Greece was bounded by two revolutions in the Greek world. It began with a "structural revolution" which "drew the political map of the Greek world" and established the poleis, the distinctively Greek city-states, and ended with the intellectual revolution of the Classical period. The Archaic period saw developments in Greek politics, economics, international relations, warfare, and culture. It laid the groundwork for the Classical period, both politically and culturally. It was in the Archaic period that the Greek alphabet developed, that the earliest surviving Greek literature was composed, that monumental sculpture and red-figure pottery began in Greece, and that the hoplite became the core of Greek armies. In Athens, the earliest institutions of the democracy were implemented under Solon, and the reforms of Cleisthenes at the end of the Archaic period brought in Athenian democracy as it was during the Classical period. In Sparta, many of the institutions credited to the reforms of Lycurgus were introduced during the period, the region of Messenia was brought under Spartan control, helotage was introduced, and the Peloponnesian League was founded, making Sparta a dominant power in Greece. The word "archaic" derives from the Greek word archaios, which means "old". It refers to the period in ancient Greek history before the Classical. The period is generally considered to have lasted from the beginning of the eighth century BC until the beginning of the fifth century BC, with the foundation of the Olympic Games in 776 BC and the Second Persian invasion of Greece in 480 BC forming notional start and end dates. The Archaic period was long considered to have been less important and historically interesting than the Classical period, and was primarily studied as a precursor to it. More recently, however, Archaic Greece has come to be studied for its own achievements. With this reassessment of the significance of the Archaic period, some scholars have objected to the term "archaic", due to its connotations in English of being primitive and outdated. No term which has been suggested to replace it has gained widespread currency, however, and the term is still in use. Much of our evidence about the Classical period of ancient Greece comes from written histories, such as Thucydides' History of the Peloponnesian War. By contrast, we have no such evidence from the Archaic period. We have written accounts of life in the period in the form of poetry, and epigraphical evidence, including parts of law codes, inscriptions on votive offerings, and epigrams inscribed on tombs. However, none of this evidence is in the quantity for which we have it in the Classical period. What is lacking in written evidence, however, is made up for in the rich archaeological evidence from the Archaic Greek world. Indeed, where much of our knowledge of Classical Greek art comes from later Roman copies, all of the surviving Archaic Greek art is original. Other sources for the period are the traditions recorded by later Greek writers such as Herodotus. However, these traditions are not part of any form of history as we would recognise it today; those transmitted by Herodotus he recorded whether or not he believed them to be accurate. Indeed, Herodotus does not even record any dates before 480 BC. Politically, the Archaic period saw the development of the polis (or city-state) as the predominant unit of political organisation. Many cities throughout Greece came under the rule of autocratic leaders, called "tyrants". The period also saw the development of law and systems of communal decision-making, with the earliest evidence for law codes and constitutional structures dating to the period. By the end of the Archaic period, both the Athenian and Spartan constitutions seem to have developed into their classical forms. The Sphinx of Naxos, on its 12.5 meters Ionic column (reconstitution), was built in 560 BC next to the Temple of Apollo in Delphi, the religious center of Ancient Greece. The Archaic period saw significant urbanisation, and the development of the concept of the polis as it was used in Classical Greece. By Solon's time, if not before, the word "polis" had acquired its classical meaning, and though the emergence of the polis as a political community was still in progress at this point, the polis as an urban centre was a product of the eighth century. However, the polis did not become the dominant form of socio-political organisation throughout Greece in the Archaic period, and in the north and west of the country it did not become dominant until some way into the Classical period. The urbanisation process in Archaic Greece known as "synoecism" – the amalgamation of several small settlements into a single urban centre – took place in much of Greece in the eighth century BC. Both Athens and Argos, for instance, began to coalesce into single settlements around the end of that century. In some settlements, this physical unification was marked by the construction of defensive city walls, as was the case in Smyrna by the middle of the eighth century BC, and Corinth by the middle of the seventh century BC. It seems that the evolution of the polis as a socio-political structure, rather than a simply geographical one, can be attributed to this urbanisation, as well as a significant population increase in the eighth century. These two factors created a need for a new form of political organisation, as the political systems in place at the beginning of the Archaic period quickly became unworkable. 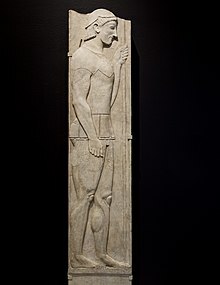 Stele of Aristion, heavy-infantryman or hoplite. 510 BC. Top of helmet and pointed beard missing. Though in the early part of the Classical period the city of Athens was both culturally and politically dominant, it was not until the late sixth century BC that it became a leading power in Greece. The attempted coup by Cylon of Athens may be the earliest event in Athenian history which is clearly attested by ancient sources, dating to around 636. At this time, it seems that Athens' monarchy had already been ended and the archonship had replaced it as the most important executive office in the state, though the archonship could only be held by members of the Eupatridae, the families which made up Athens' aristocracy. The earliest laws of Athens were established by Draco, in 621/0; his law on homicide was the only one to have survived to the Classical period. Draco's law code aimed to replace private revenge as the first and only response of an individual to an offence committed against them. The law code of Draco, however, failed to prevent the tensions between the rich and poor which were the impetus to Solon's reforms. In 594/3 BC, Solon was appointed "archon and mediator". Exactly what his reforms consisted of is uncertain. He claimed to have taken up the horoi to set the land free, but the exact meaning of horoi is unknown; their removal seems, however, to have been part of the problem of hektemoroi – another word whose meaning is obscure. Solon was also credited with abolishing slavery for debtors, and establishing limits on who could be granted Athenian citizenship. Solon instituted radical constitutional reform, replacing noble birth as a qualification for office with income. The poorest – called thetes – could hold no offices, although they could attend the Assembly and the law courts, while the richest class – the pentacosiomedimni – were the only people eligible to become treasurer, and possibly archon. He set up the Council of the Four Hundred, responsible for discussing motions which were to come before the Assembly. Finally, Solon substantially reduced the powers of the archon by giving citizens the right of appeal; their case was judged by the Assembly. Sparta's constitution took on the form it would have in the Classical period during the eighth century BC. According to Thucydides, the Spartan constitution was roughly four-hundred years old, which would place the semi-legendary lawgiver Lycurgus of Sparta as being active during the late 9th century BC. The First Messenian War, probably taking place from approximately 740 to 720 BC, saw the strengthening of the powers of the Gerousia against the assembly, and the enslavement of the Messenian population as Helots. Around the same time, the ephors gained the power to restrict the actions of the kings of Sparta. From around 560 BC, Sparta began to build a series of alliances with other Greek states, which became the Peloponnesian League: by 550, cities such as Elis, Corinth, and Megara would be part of the alliance. In the eighth and seventh centuries BC, Greeks began to spread across the Mediterranean, the Sea of Marmara, and the Black Sea. This was not simply for trade, but also to found settlements. These Greek colonies were not, as Roman colonies were, dependent on their mother-city, but were independent city-states in their own right. Greeks settled outside of Greece in two distinct ways. The first was in permanent settlements founded by Greeks, which formed as independent poleis. The second form was in what historians refer to as emporia; trading posts which were occupied by both Greeks and non-Greeks and which were primarily concerned with the manufacture and sale of goods. Examples of this latter type of settlement are found at Al Mina in the east and Pithekoussai in the west. The earliest Greek colonies were on Sicily. Many of these were founded by people from Chalcis, but other Greek states, such as Corinth and Megara were also responsible for early colonies in the area. By the end of the eighth century BC, Greek settlements in southern Italy were also well established. In the seventh century, Greek colonists expanded the areas that they settled. In the west, colonies were founded as far afield as Marseilles. In the east, the north Aegean, the Sea of Marmara, and the Black Sea all saw colonies founded. The dominant coloniser in these parts was Miletus. At the same time, early colonies such as Syracuse and Megara Hyblaia began to themselves establish colonies. In the west, Sicily and southern Italy were some of the largest recipients of Greek colonisers. Indeed, so many Greek settlements were founded in southern Italy that it was known in antiquity as Magna Graecia – "Great Greece". It has been observed that in the last quarter of the eighth century, new Greek settlements were founded in Sicily and southern Italy at an average rate of one every other year, and Greek colonists continued to found cities in Italy until the mid-fifth century BC. Archaic Greece from the mid-seventh century BC has sometimes been called an "Age of Tyrants". The word τύραννος (tyrannos, whence the English "tyrant") first appeared in Greek literature in a poem of Archilochus, to describe the Lydian ruler Gyges. The earliest Greek tyrant was Cypselus, who seized power in Corinth in a coup in 655 BC. He was followed by a series of others in the mid-seventh century BC, such as Orthagoras in Sicyon and Theagenes in Megara. Various explanations have been provided for the rise of tyranny in the seventh century BC. The most popular of these explanations dates back to Aristotle, who argued that tyrants were set up by the people in response to the nobility becoming less tolerable. As there is no evidence from the time that the nobility were becoming increasingly arrogant during the period, modern explanations of seventh century tyranny have tried to find other reasons for unrest among the people. Against this position, Drews argues that tyrannies were set up by individuals who controlled private armies, and that early tyrants did not need the support of the people at all, whilst Hammond suggests that tyrannies were established as a consequence of in-fighting between rival oligarchs, rather than between the oligarchs and the people. However, recently historians have begun to question the existence of a seventh century "age of tyrants". In the Archaic period, the Greek word tyrannos, according to Victor Parker, did not have the negative connotations it had gained by the time Aristotle wrote his Constitution of the Athenians. When Archilochus used the word tyrant, it was synonymous with anax (an Archaic Greek word meaning "king"). Parker dates the first use of the word tyrannos in a negative context to the first half of the sixth century, at least fifty years after Cypselus took power in Corinth. It was not until the time of Thucydides that tyrannos and basileus ("king") were consistently distinguished. Similarly, Greg Anderson has argued that Archaic Greek tyrants were not considered illegitimate rulers, and cannot be distinguished from any other rulers of the same period. Greek population doubled during the eighth century, resulting in more and larger settlements than previously. This was part of a wider phenomenon of population growth across the Mediterranean region at this time, which may have been caused by a climatic shift that took place between 850 and 750, which made the region cooler and wetter. This led to the expansion of population into uncultivated areas of Greece and was probably also a driver for colonisation abroad. Evidence from human remains shows that average age at death increased over the Archaic period, but there is no clear trend for other measures of health. The size of houses gives some evidence for prosperity within society; in the eighth and seventh centuries, the average house size remained constant around 45–50 m², but the number of very large and very small houses increased, indicating increasing economic inequality. From the end of the seventh century, this trend reversed, with houses clustering closely around a growing average. Not all arable land in Greece was yet under cultivation in the Archaic period. Farms appear to have been small, cohesive units, concentrated near settlements. They were highly diversified, growing a wide variety of crops simultaneously, in order to make consistent use of human resources throughout the year and to ensure that the failure of any one crop was not too much of a disaster. Crop rotation was practiced, alternating between legumes and cereals (barley and durum), and the land was left fallow every other year. Alongside these, farmers cultivated vines, olives, fruit, and vegetables as cash crops for sale in local centres and abroad. Livestock were of secondary importance. Sheep and goats, in particular, were kept for meat, milk, wool, and fertiliser, but they were difficult to sustain and large herds were a sign of exceptional wealth. A team of oxen could increase agricultural output significantly, but were expensive to maintain. Horses and large herds of cattle were the preserve of the mega-rich. This pattern had probably developed before the beginning of the period and remained relatively consistent throughout it. The idea that it was preceded by a period of pastoralism and that agriculture only became dominant in the course of the Archaic period is not supported by the archaeological or literary evidence. No technological innovations in agriculture appear to have occurred, except possibly the increased use of iron tools and more intensive use of manure. The main source for the practice of agriculture in the period is Hesiod's Works and Days, which gives the impression of very small subsistence holdings in which the owner performed most of the labour personally; close reading reveals that much of the produce is to be sold for profit, much of the work to be performed by slaves (douloi or dmoes), and much of the owner's time to be spent away from the farm. Slaves' labour was supplemented by labourers who worked for a wage, as sharecroppers (called hektemoroi at Athens), or to pay off debts; this practice seems to have increased in the eighth century as the growth of the population increased the number of workers available, and intensified in the seventh century with the development of legally enforced debts and the status of the labourers increasingly becoming a source of social strife. By the late eighth century BC, the Archaic Greek world had become involved in an active trade network around the Aegean. It was this trade network which was the source of the orientalizing influence on Greek art in the early part of the Archaic period. Meanwhile, to the west, trade between Corinth and Magna Graecia in Southern Italy and Sicily was booming. The eastern trade mainly involved the Greek islands, with Aegina, for instance, acting as an intermediary between the east and the Greek mainland. East Greek states would go on to become extremely prosperous through the sixth century due to the trade with Asia and Egypt. Of the mainland cities, those on the coast were the biggest recipients of trade from the east, especially Corinth. In the early part of the Archaic period, Athens does not seem to have been particularly actively involved in this eastern trade, and very few examples of eastern imports have been found in Athens from the eighth or early seventh centuries. By contrast, nearby Euboea had trade-links with the east as early as the first half of the eighth century, and the earliest pottery from the Greek islands found at Al Mina in modern Syria is from Euboea. By the sixth century, Greece was part of a trade network spanning the entire Mediterranean. Sixth century Laconian pottery has been found as far afield as Marseilles and Carthage to the west, Crete to the south and Sardis to the East. Silver stater of Aegina, 550–530 BC. At the beginning of the Archaic period, coinage had not yet been invented. The Greeks measured the value of objects or fines using certain valuable objects, such as oxen, tripods, and metal spits, as units of account. As in the Near East, precious metal bullion was used as a medium of exchange, principally gold at first, but mainly silver by the beginning of the sixth century. The weight of this bullion (often known as hacksilber) was measured using standard units, named for their value in terms of metal spits (obeloi) and handfuls (drachmai) of metal spits; these terms would later be used as names for Greek coin denominations. Coinage was invented in Lydia around 650 BC. It was quickly adopted by Greek communities in western Asia Minor, although the older system of bullion remained in use as well. The island of Aegina began to issue its distinctive "turtle" coins before 550 BC, and from there coinage spread to Athens, Corinth and the Cycladic Islands in the 540s BC, Southern Italy and Sicily before 525 BC, and Thrace before 514 BC. Most of these coinages were very small and were mostly only used within the community that issued them, but the "turtles" of Aegina (from 530 or 520 BC) and the "owls" of Athens (from 515 BC) were issued in great quantity and exported throughout the Greek world. The images on coins initially changed rapidly, but increasingly each community settled on a single image or set of images. Some of these were the symbol or image of an important deity in the city or visual puns on the city's name, but in many cases their meaning is obscure and may not have been chosen for any special reason. A late Achaic coin of Athens (circa 500/490–485 BC) discovered in Pushkalavati in Ancient India. This coin is the earliest known example of its type to be found so far east. The reasons for the rapid and widespread adoption of coinage by the Greeks are not entirely clear and several possibilities, which are not mutually exclusive, have been suggested. One possibility is the increased ease of commerce which coinage allowed. Coins were of standardised weights, which meant that their value could be determined without weighing them. Furthermore, it was not necessary for users of coinage to spend time determining whether the silver was pure silver; the fact that the coin had been issued by the community was a promise that it was worth a set value. Another possibility is that coinage was adopted specifically to enable communities to make payments to their citizens, mercenaries and artisans in a transparent, fair and efficient way. Similarly, when wealthy members of the community were required to contribute wealth to the community for festivals and the equipment of navies, coinage made the process more efficient and transparent. A third possibility, that coinage was adopted as an expression of a community's independence and identity, seems to be anachronistic. In the visual arts, the Archaic period is characterised by a shift towards representational and naturalistic styles. It was the period in which monumental sculpture was introduced to Greece, and in which Greek pottery styles went through great changes, from the repeating patterns of the late geometric period to the earliest red figure vases. The early part of the Archaic period saw distinctive orientalizing influences, both in pottery and in sculpture. The period was also an innovative period in Greek literature, with the development of the Greek alphabet, and the composition of the earliest surviving Greek poetry. The kore known as the Dedication of Nikandre is probably the oldest to survive. 180 years after it was made, the genre was at an end, and Greek sculpture was recognisably Classical. Life-size human sculpture in hard stone began in Greece in the Archaic period. This was inspired in part by ancient Egyptian stone sculpture: the proportions of the New York Kouros exactly correspond to Egyptian rules about the proportion of human figures. In Greece, these sculptures best survive as religious dedications and grave markers, but the same techniques would have also been used to make cult images. The best-known types of Archaic sculpture are the kouros and kore, near life-size frontal statues of a young man or woman, which were developed around the middle of the seventh century BC in the Cyclades. Probably the earliest kore produced was the Dedication of Nikandre, which was dedicated to Artemis at her temple on Delos between 660 and 650 BC, while kouroi began to be created shortly after this. Kouroi and korai were used to represent both humans and divinities. Some kouroi, such as the Colossus of the Naxians from around 600 BC, are known to represent Apollo, while the Phrasikleia Kore was meant to represent a young woman whose tomb it originally marked. Early in the seventh century around 650 BC when kore are widely introduced, Daedalic style made an appearance in Greek sculpture. This style consisted most noticeably of a geometric pattern of female subjects' hair framing their face. On male sculptures they were often posed with one foot in front, as if in motion. Over the course of the sixth century, kouroi from Attica become more lifelike and naturalistic. However, this trend does not appear elsewhere in the Greek world. The genre began to become less common over the last part of the sixth century as the elites who commissioned kouroi declined in influence, and by around 480 kouroi were no longer made. The Archaic period saw a shift in styles of pottery decoration from the repeating patterns of the geometric period, through the eastern-influenced orientalizing style to the more representational black-figure and red-figure techniques. The period saw a shift in the decoration of Greek pottery from abstract to figurative styles. During the Greek Dark Ages, following the fall of the Mycenaean civilisation, Greek pottery decoration had been based around increasingly elaborate geometrical patterns. Human figures first appeared on Greek pots in Crete in the early part of the ninth century BC, but did not become common on mainland Greek pottery until the middle of the eighth century BC. The eighth century saw the development of the orientalizing style, which signalled a shift away from the earlier geometric style and the accumulation of influences derived from Phoenicia and Syria. This orientalizing influence seems to have come from goods imported to Greece from the Near East. At the beginning of the seventh century BC, vase painters in Corinth began to develop the black figure style. At the same time, potters began to use incisions in the clay of vases in order to draw outlines and interior detailing. This adoption of incision, probably taken from eastern metalwork, allowed potters to show fine details of their decorations. As the Archaic period drew to a close, red-figure pottery was invented in Athens, with the first examples being produced about 525 BC, probably by the Andokides painter. The invention of the red-figure technique in Athens came at around the same time as the development of other techniques such as the white ground technique and Six's technique. The earliest extant Greek literature comes from the Archaic period. Poetry was the predominant form of literature in the period. Alongside the dominant lyric and epic traditions, tragedy began to develop in the archaic period, borrowing elements from the pre-existing genres of archaic Greek poetry. By the sixth century BC the first written prose in Greek literature appeared. Though there would certainly have been a pre-existing literary tradition in Greece, the earliest surviving works are by Homer. Homer's poetry, though it dates to around the time that the Greeks developed writing, would have been composed orally – the earliest surviving poetry to have certainly been composed in writing is that of Archilochus, from the mid-seventh century BC. In contrast with the Classical period, in which the literary culture of Athens dominated the Greek world, Archaic poetic tradition was geographically spread out. Sappho and Alcaeus, for instance, were from Lesbos, while Pindar came from Thebes, and Alcman from Sparta. After the end of the Mycenaean period, the art of writing was lost in Greece: by the ninth century probably no Greeks understood the Bronze Age Linear B writing system. From the ninth century BC, however, objects inscribed with Phoenician writing began to be brought into the Greek world, and it was from this Phoenician script that the Greek alphabet developed in the eighth century BC. By the middle of the eighth century BC, pottery inscribed in Greek begins to occur in the archaeological record. The earliest known inscriptions in Greek tend to identify or explain the object on which they are inscribed. 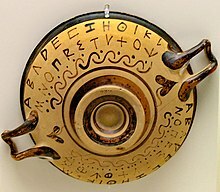 Possibly the earliest known Greek inscription is found on a jug from the first half of the eighth century BC, discovered in Osteria dell'Osa in Latium. Most early inscriptions were written in verse, though some from Ionia were in prose, influenced by the prose traditions of Ionia's eastern neighbours. From the beginning of the seventh century, curses and dedications began to be inscribed on objects, and by the sixth century, surviving inscriptions include public records such as law codes, lists of officials, and records of treaties. A Hoplite (probably Spartan), on the Vix Crater, circa 500 BC. An archaic Greek cuirass, dated to the late 7th century BC. In the Archaic period, the most significant military development was the adoption of hoplite warfare by the Greek states. This occurred in the early part of the seventh century BC. The panoply, or hoplite's armour, began to appear in the eighth century, and the earliest known example comes from Argos in the late eighth century. While the pieces which made up the panoply were all in use in Greece by the end of the eighth century, our first evidence for it being worn as a complete set of armour does not come until around 675 BC, where it is depicted on a Corinthian vase painting. The adoption of the phalanx tactics which would be used by hoplites in the Classical period does not appear to have taken place until the mid-seventh century; before this point, the older style of combat in which spears were thrown at the enemy before closing quarters was still used. In the naval sphere, the Archaic period saw the development of the trireme in Greece. In the eighth century, Greek navies began to use ships with two banks of oars, and the three banked trireme seems to have become popular in the seventh century. Corinth was probably the first place in the Greek world to adopt the trireme in the mid seventh century BC. It was not until the mid-sixth century, however, that the trireme became the most popular design for Greek battleships, due to its expense. According to Thucydides, the period saw the first Greek naval battles; he dates the first to around 664 BC. ^ Burn, A. R. (1982). The Pelican History of Greece. London: Penguin. pp. 116–117. ^ Bury, J. B.; Meiggs, Russell (1956). A History of Greece to the death of Alexander the Great (3 ed.). London: Macmillan. pp. 135–136. ^ Hammond, N. G. L. (1967). A history of Greece. Oxford: Oxford University Press. p. 103. ^ Sheedy 2012, pp. 106, 110; Van Alfen 2012, p. 89; Psoma 2012, p. 166ff. ^ Rutter 2012, p. 128ff. ; Fischer-Bossert 2012, p. 143ff. ^ Psoma 2012, p. 157ff. ^ a b Ashmole, Bernard (December 1936). "Review: Daedalic Art". The Classical Review. 50 (6): 233–235. doi:10.1017/s0009840x00078057. JSTOR 705500. Anderson, Greg (2005). "Before Turannoi Were Tyrants: Rethinking a Chapter of Early Greek History". Classical Antiquity. 24 (2): 173–222. doi:10.1525/ca.2005.24.2.173. Andrewes, A. (1982). "The Growth of the Athenian State". In Boardman, John; Hammond, N.G.L. The Cambridge Ancient History. III.iii (2 ed.). Cambridge: Cambridge University Press. Antonaccio, Carla M. (2007). "Colonization: Greece on the Move 900–480". In Shapiro, H.A. The Cambridge Companion to Archaic Greece. Cambridge: Cambridge University Press. Boardman, John (1982). "The Material Culture of Archaic Greece". In Boardman, John; Hammond, N.G.L. The Cambridge Ancient History. III.iii (2 ed.). Cambridge: Cambridge University Press. Boardman, John; Hammond, N.G.L. (1982). "Preface". In Boardman, John; Hammond, N.G.L. The Cambridge Ancient History. III.iii (2 ed.). Cambridge: Cambridge University Press. Cantarella, Eva (2005). "Gender, Sexuality, and Law". In Gagarin, Michael; Cohen, David. The Cambridge Companion to Ancient Greek Law. Cambridge: Cambridge University Press. Cook, R.M. (1979). "Archaic Greek Trade: Three Conjectures". The Journal of Hellenic Studies. 99: 152–155. doi:10.2307/630641. JSTOR 630641. Davies, John K. (2009). "The Historiography of Archaic Greece". In Raaflaub, Kurt A.; van Wees, Hans. A Companion to Archaic Greece. Blackwell Publishing. pp. 3–21. ISBN 9781118451380. Drews, Robert (1972). "The First Tyrants in Greece". Historia: Zeitschrift für Alte Geschichte. 21 (2). Fischer-Bossert, Wolfgang (2012). "The Coinage of Sicily". In Metcalf, William E. The Oxford Handbook of Greek and Roman Coinage. Oxford University Press. pp. 142–156. ISBN 9780195305746. Hall, Jonathan M. (2007). "Polis, Community, and Ethnic Identity". In Shapiro, H.A. The Cambridge Companion to Archaic Greece. Cambridge: Cambridge University Press. Hammond, N.G.L (1982). "The Peloponnese". In Boardman, John; Hammond, N.G.L. The Cambridge Ancient History. III.iii (2 ed.). Cambridge: Cambridge University Press. Hunt, Peter (2007). "Military Forces". In Sabin, Philip; van Wees, Hans; Whitby, Michael. The Cambridge History of Greek and Roman Warfare. Cambridge: Cambridge University Press. Hurwit, Jeffrey M. (2007). "The Human Figure in Early Greek Sculpture and Vase Painting". In Shapiro, H.A. The Cambridge Companion to Archaic Greece. Cambridge: Cambridge University Press. Jeffery, L.H. (1982). "Greek Alphabetic Writing". In Boardman, John; Edwards, I.E.S. ; Hammond, N.G.L. ; Sollberger, E. The Cambridge Ancient History. III.i (2 ed.). Cambridge: Cambridge University Press. Konuk, Koray (2012). "Asia Minor to the Ionian Revolt". In Metcalf, William E. The Oxford Handbook of Greek and Roman Coinage. Oxford University Press. pp. 43–60. ISBN 9780195305746. Kroll, John E. (2012). "The Monetary Background of Early Coinage". In Metcalf, William E. The Oxford Handbook of Greek and Roman Coinage. Oxford University Press. pp. 33–42. ISBN 9780195305746. Markoe, Glenn (1996). "The Emergence of Orientalizing in Greek Art: Some Observations on the Interchange between Greeks and Phoenicians in the 8th and 7th Centuries B.C.". Bulletin of the American Schools of Oriental Research. 301: 47–67. doi:10.2307/1357295. JSTOR 1357295. Morris, Ian (2009). "The Eighth Century Revolution". In Raaflaub, Kurt A.; van Wees, Hans. A Companion to Archaic Greece. Blackwell Publishing. pp. 64–80. ISBN 9781118451380. Osborne, Robin (1998). Archaic and Classical Greek Art. Oxford: Oxford University Press. ISBN 9780192842022. Osborne, Robin (2009). Greece in the Making: 1200–479 BC (2 ed.). London: Routledge. ISBN 9780203880173. Parker, Victor (1998). "Τυραννος. The Semantics of a Political Concept from Archilochus to Aristotle". Hermes. 126 (2). Psoma, Selene (2012). "Greece and the Balkans to 360 B.C.". In Metcalf, William E. The Oxford Handbook of Greek and Roman Coinage. Oxford University Press. pp. 157–172. ISBN 9780195305746. Rutter, N.K. (2012). "The Coinage of Italy". In Metcalf, William E. The Oxford Handbook of Greek and Roman Coinage. Oxford University Press. pp. 128–140. ISBN 9780195305746. Shapiro, H.A. (2007). "Introduction". In Shapiro, H.A. The Cambridge Companion to Archaic Greece. Cambridge: Cambridge University Press. Sheedy, Kenneth (2012). "Aegina, the Cyclades, and Crete". In Metcalf, William E. The Oxford Handbook of Greek and Roman Coinage. Oxford University Press. pp. 105–127. ISBN 9780195305746. Snodgrass, Anthony (1965). "The Hoplite Reform and History". The Journal of Hellenic Studies. 85. Snodgrass, Anthony (1980). Archaic Greece: The Age of Experiment. London Melbourne Toronto: J M Dent & Sons Ltd. ISBN 978-0-460-04338-0. Spier, J. (1990). "Emblems in Archaic Greece". Bulletin of the Institute of Classical Studies. 37: 107–130. doi:10.1111/j.2041-5370.1990.tb00222.x. Van Alfen, Peter G. (2012). "The Coinage of Athens, Sixth to First Century B.C.". In Metcalf, William E. The Oxford Handbook of Greek and Roman Coinage. Oxford University Press. pp. 88–104. ISBN 9780195305746. Van Wees, Hans. (2009). "The Economy". In Raaflaub, Kurt A.; van Wees, Hans. A Companion to Archaic Greece. Blackwell Publishing. pp. 444–467. ISBN 9781118451380.